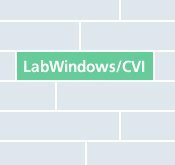 LabWindows/CVI offers an easy-to-use mixture of graphical elements for controlling of hardware and display of measured data and a universal C-compiler. For a fast start with the Spectrum boards there are some universal examples showing how to include the Spectrum driver. There are some example applications integrated like a universal oscilloscope program and a universal signal generator. All programs are available as source code. LabWindows/CVI offers a fast way to develop graphical measurement applications including the performance of a C-compiler.